I caught this graphic from my local news out of the corner of my eye. Frankly, your guess is as good as mine. I see Chicago's Schwarz has the standard AOL 8"
Indeed. A sizable, yet realistic weekend. Isn't it what we all would want? If its AOL - It's clearly overstated. But what is surpising is that since that City of Big Shoulders is such a size queen you would think it would be a 10 or 11. Is it what Stedman and or Gayle see in the morning? May da Schwarz be with you! I knew eventually the spaceballs joke would be forthcoming! Okay smartasses, I'll be the one to ruin the joke here. Phil Schwarz is the weather guy for ABC 7 Chicago. 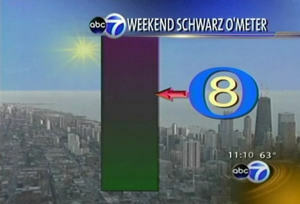 The "Schwarz O'Meter" reflects the terrific weather Chicago is expected to have this weekend. Of course, considering that it will either be -17 below or 98 by Monday morning, this whole "Meter" thing is just Phil's way of telling Chicagoans that they better get up off their asses and go out and play before it all comes crashing down around them...just in time for the morning rush hour on Monday. Knowing Chicago this time of the year, the Schwartz O'Meter will be at a 2 by Monday. Speaking of Chicago weathermen, are you aware that WGN's ace weatherman, Tom Skilling, is the brother of the 'other' Skilling if ENRON fame? My first impression was that it had something to do with Ahnold Schwarzenpfeffer--uh--Schwarzenegger. Is there supposedly a building there--I presume, in Chicago--or is it just photoshopped? The shot behind the "meter" is taken from the top of the Sears Tower - no photoshopping there. And yeah, Jack...Tommy's brother Michael is in deep doo-doo, huh? I feel bad for Tom. He's a really nice guy, and truly passionate about his job. Best weatherman I've ever watched. And I thought I knew heavy weather. You know, the folks over at Channel 2 would never do something this silly. WGN might. (Have you seen the way they do their traffic report? Little cars. Little red, green, and yellow cars.) The weather and the drivers. Those were two things I was not prepared for when I came to Chicagoland.